Sometimes quilters are hesitant to adjust sewing machine tension when stitches aren't quite right because they are unsure if the adjustments will create even more of an issue. Don't hesitate to make tension adjustments because they're often necessary. Sewing machine tension adjustment is controlled by devices that separately control the needle thread and the bobbin thread, putting varying amounts of tension (or strength) on the threads they control in order to form a strong, balanced stitch. 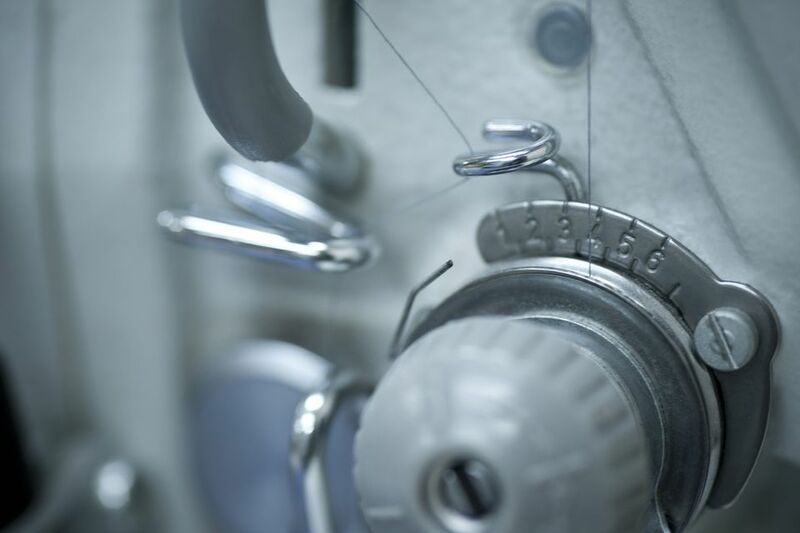 Sewing machine tension can be tightened or loosened to affect the needle thread, the bobbin thread, or both. Machine stitches should look the same on both sides of the seam when you sew patchwork pieces together or when you machine quilt through the quilt's top, batting, and backing. When stitches are balanced, they will be evenly spaced on both sides of the project, with threads that lie flat against their own side of the fabric. The little knot formed between stitches (at each indentation between them) should be invisible, buried in the layers. If either thread pulls easily out of the seam when you give it a tug, you know there's a sewing machine tension problem. The tension that controls the thread coming through the needle is too strong, pulling the bobbin thread to the top. The tension that controls the thread coming out of the bobbin is too weak, allowing the needle thread's tension to take over. The tension that controls the thread coming out of the bobbin is too strong, pulling the needle thread to the underside. The tension that controls the thread coming through the needle is too weak. Grab your sewing machine user's manual. Unthread the top thread―the thread that goes through the needle. Remove the bobbin (and its case) and clean the bobbin area of the machine as directed in your manual. Check all pathways that the upper thread must pass through, making sure little bits of thread or fuzz aren't stuck in any of the visible mechanisms. Are you using the best needle for the job? If the needle has been used to sew more than a few projects or used for one large project, it's time for a change. How about the thread―is it suitable for the fabrics you are sewing? Follow the manual's instructions to rethread the sewing machine (the presser foot should likely be up and so should the needle). Remove the bobbin from its case. Reinsert the bobbin into the case, checking the user's manual to make sure the thread is flowing in the correct direction. Place the case and bobbin back into the machine (a bit of thread should stick out). Use the hand crank (or follow other instructions) to take the needle downward, where it should catch the bobbin thread and pull it to the top. Pull the needle thread and bobbin thread out just a bit to create short tails. Sew another seam, holding on to that 2-thread tail as you begin. Are the stitches still unbalanced? If they are, let's troubleshoot a bit more. Are You Using the Same Thread in the Bobbin and Through the Needle? We typically use the same threads in both places when sewing patchwork. If you are not, switch out one or the other and try again. We often do not use the same threads on the top and bottom when we machine quilt, so tension adjustments will probably be necessary. If you've determined that more tension (strength) is required for the needle thread, turn the tension knob (or digital setting) up just a bit (refer to your manual). If the bobbin needs a little more pull, lower the needle thread's tension setting. Test another seam. Is it better, but maybe not entirely accurate? Change the setting and try again. Many people are hesitant to change the tension of their bobbin, but you might find that step offers the best results when you're machine quilting. You should see a small screw on the flat/closed side of the bobbin case. Turning the screw a tiny bit counterclockwise will loosen the bobbin tension; turning it clockwise will tighten the tension. Some quilters keep two bobbin cases on hand, leaving one as-is from the factory and using the other when they need to make adjustments. If you have just one bobbin, use a permanent marker to draw a fine line directly across from the slot of the screw before you move it―that step will show you where to set the screw when it's time to return to normal tension. Be sure to test your machine quilting stitches on a practice quilt sandwich (with the same basic top/batting/backing) before you stitch through the layers of an actual quilt.